Embellish away - it'll make the stories that much more memorable. Duck out on the balcony for drinks and a game of cards if it's warm enough. Break out your entire repertoire - for once, you actually have time to cook. Set your alarm so you don't miss the fresh Champagne Powder at Steamboat Ski Resort. The gondola is a quick 8 minute walk. The quiet, peaceful atmosphere of the resort is perfect for romantic getaways. Stock up on snacks, Spring Creek Trail and Emerald Mountain are less than 12 minutes drive from the resort. 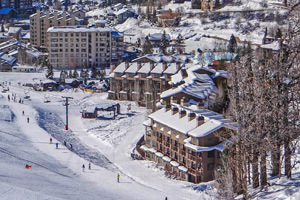 Nestled at the base, just 200 yards from the gondola, ski village shops and restaurants, The Lodge at Steamboat makes an ideal home base for fans of all things outdoorsy. Keep stashes of hand warmers, clementines and protein bars near the front door for pocket-stuffing on the way out – after you do one last helmet/goggle/glove check. Onsite ski storage keeps your living space blissfully free of dripping gear, and the clubhouse offers a comfortable place to kick back with a book or tablet. A daily stop at the indoor or outdoor hot tubs is non-negotiable as far as the kids are concerned, but there’s plenty of time for après ski drinks before you go. Planning a summertime stay? You’ll have access to a few additional perks, like tennis courts, BBQ grills and the outdoor pool – assuming you can rally after hiking and biking all day. Individually decorated one- to three-bedroom vacation condos are all equipped with private balconies, and cozy living areas with gas fireplaces ready at the flip of a switch. Full kitchens invite you to work your breakfast magic, flipping omelets or making a cinnamon-sugary french toast bake drizzled with syrup. Overslept? No worries, Plan B is on standby. You’ll find complimentary coffee and doughnuts ready for you in the lobby. Grab as much as you can balance along with your gear (and the kids’) on your way to the guest shuttle. Spacious living rooms give you plenty of room to spread out board games or construct an elaborate blanket fort for movie night. And the housekeeping crew does a light run-through every other day, leaving you with more time for the hot tub or tennis courts, depending on the season.